There’s an element of unadulterated terror not unlike that of driving too fast along winding cliff roads associated with recording. It’s silly, really (because it’s just rock and roll), but recording captures a moment of “truth” much more definitive than any live performance. Even though you can go back and redo bits and fix mistakes, if you don’t get the essence of the thing right from the beginning—find the murmuring and beating heart of it—the record will never be quite right. Probably because The Cardinal Points came together as a recording project, we use our studio not just to capture a performance of a song, but—as pretentious as this sounds/might be—to attempt to capture the very heart of it. This entry was posted in photo and tagged bass, drums, recording on July 1, 2013 by thecardinal. Washburn (inexplicably wearing stupid sunglasses) proves that he doesn’t play the piano very well, and then Elton John is mentioned. Includes some light profanity. This entry was posted in video and tagged piano, random, recording, stupid on May 6, 2013 by thecardinal. This entry was posted in music and tagged keyboards, nonsense, recording on March 18, 2013 by thecardinal. Big Sound, a photo by The Cardinal Points on Flickr. Recording guitars for a new song. Nerd alert:Gibson Sonex into a modified Boss Compressor pedal into an EHX Memory Man then split: fx signal into a Mesa Boogie, and dry into a Vox AC30. Both close mic’d with Shinybox 46U’s and then also a room mic (not pictured) about 15 feet out, which is a DIY homage to a U47. Recording chains are: AC30 (main amp) > 46U > Great River ME-1NV > DIY Hairball/mnats 1176 (4:1, fast attack and release, set to just “tickle” the meter) > converter. Both Mesa 46U and Room “47” > FMR RNP > convertor (no comp). 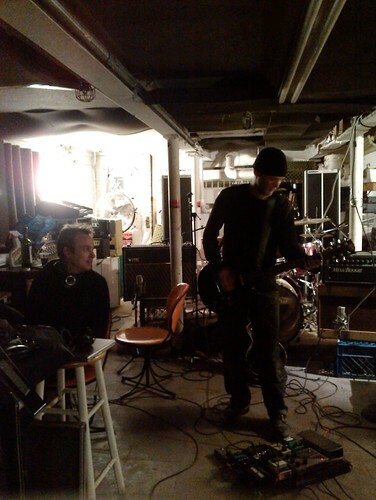 This entry was posted in photo and tagged guitar, nerd alert, recording on January 9, 2013 by thecardinal.